When I saw Helen’s prompt for this week was the Blues, my mind went directly to one of my favourite Bluesy songs, “Grieve,” by Chachamaru. Yukihiro “Chachamaru” Fujimura was the reason I went to Japan for the first time, in October of 2005. He was playing lead guitar at the time with a singer named Gackt; I went to two of their concerts when I was there. After the one in Hiroshima, I gathered up my courage and asked one of the crew if I could meet Chacha. Since I wasn’t asking to meet the star attraction of the show, and I told him I’d traveled all the way from Canada just to see the concert, the nice man told me he’d see what he could do. He got on his radio and asked backstage if I could go back. The answer was no, unfortunately. I did, however, have my copy of Chacha’s only solo CD in my purse, so I asked if I could get it signed. My CD disappeared and as I was waiting, the man’s radio beeped and he asked me how to spell my name. Basically, my CD cover met the man. I was thrilled. It remains, to this day, one of my most precious possessions. I’m amazed I found “Grieve” on Youtube after all these years. It’s a fan-made video with pictures of Chacha and the audio of the song. Lyrics, translated to English, to follow. 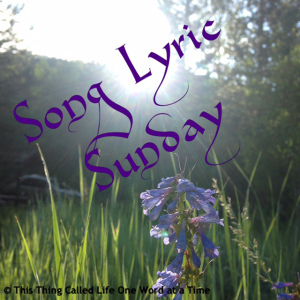 Categories: Blogging, Blogs, Japan, Song Lyric Sunday | Tags: Air, Blues, Chachamaru, Grieve, Helen Espinosa, Japanese music, lyrics, music prompt, Yukihiro Fujimura | Permalink.